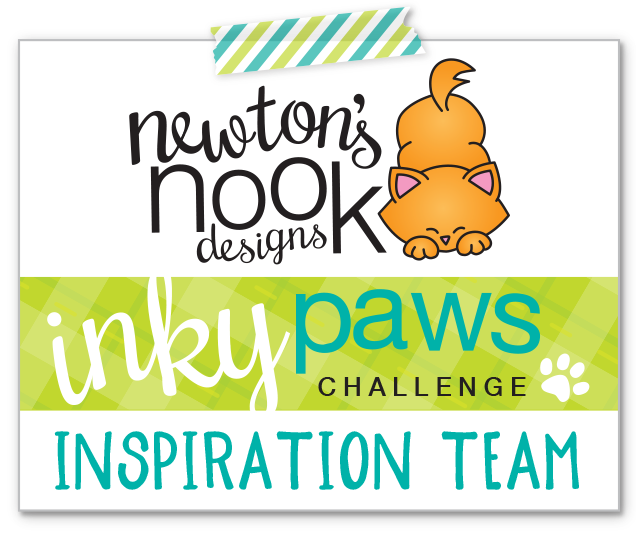 I am super excited to be part of the Deck the Halls with Inky Paws Blog Hop this year! I love Newton’s Nook Designs’ products and they have so many holiday themed ones! It is hard to choose, so i decided to use and older set which is new to me: Winston’s Home for Christmas. For the holidays when i give a present, i love to have a card and a matching tag to put on the wrapped present. When i designed my card, I made sure the design allows me to create a matching tag too. I stamped Winston and a matching sentiment on each panels using a waterproof black ink (my favourite is the Gina K Designs Amalgam ink). The sentiment on the tag is from the gorgeous Sentiments of the Season stamp set. I used Altenew watercolours and a waterbrush to colour the images. It looks so dreamy after it got dry, even if i am at the very beginning of my watercolouring journey. For the card i trimmed a dark red cardstock slightly larger than the scalloped rectangle and mounted it on a pretty patterned paper piece (Doodlebug Milk and Cookies) with 3D foam tape. For the tag i used the same patterned paper and red cardstock to embellish it. I am so happy that the Fancy Edges Tag die set has all sorts of dies to customize your tags. I added a bit of green too to make it really fancy. A piece of chunk red/white twine finished it off. I hope you got inspired to make your own Christmas cards with matching tags. And to step out of your comfort zones to have some extra fun! Happy hopping and see you soon! < Previous Hot chocolate kind of day! These are so cute! 🙂 Love the matching tag. I hear you on watercoloring being out of your comfort zone, I feel the same way. But you rocked both the card and the tag, love these!! These are adorable, Zosfia! Winston is definitely one of my favorite characters! I especially like your tag. The bear is really cute. Your watercoloring looks wonderful. I am trying to learn, so I’m going to study yours. First of all, what an ADORABLE card/tag set!!! Second, I LOVE your watercolor!!! It totally surprised me! It’s always so refreshing to see people try new/different techniques, especially when they’re so good at it, too! I’m ordering the Winston set today, it’s been on my wishlist forever!!! So glad you used Winston and your card and tag! He is such a cutie and I love how you colored the images. Awww!!! Too sweet and cute!!! Love your creations!!! So adorable! I love the pink car! This image of Winston is still one of my favorite holiday stamps! Thank you for the cute inspiration! The tag is adorable too! Such a sweet card! Love the tag as well! Nicely done! Happy Holidays! It always warms my heart to see the older sets getting a little love. Such a pretty card and tag set. Love that patterned paper! I hope you and your loved ones have a wonderful holiday season. that card and tag are super sweet! These are super awesome and I love them both! Like the coloring on your creations. Like the layers & scene. What a cute card and tag combo! I love how you colored is softly and then the matching background paper! Adorable card and matching tag! I got teary-eyed over the sentiment: All Hearts come home for Christmas!” I think I may have to use this idea for next year’s Christmas card. Beautifully done! after he gets there. Wonderful. Cute card and tag. I like your coloring. What an adorable card and great tag. Cheers. Love that car image. Cute ideas!